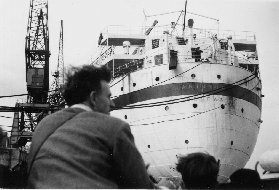 We migrated from Birmingham as a 10 pound pommie family on the SS Asturius in 1950, boarding in Southampton. I was four years of age and have vague memories of the journey. I remember the heat in the Red Sea as the swimming pool was not operating and the crew rigged up buckets and hoses for us to cool on deck. I developed prickly heat. It was so hot and I can remember hiding in a deck chair as my mother came looking for me to go to our cabin to sleep. There were four of us, mum and dad (Dim and Mick Gregory) and David my older brother. Dad was ex Gloucester Regimental Sergeant-Major and mum worked in the British Post Office during the Second World War. I remember going ashore in Colombo Ceylon and the little dark children diving for coins that were thrown over the side, it was dark and hot. We landed in Fremantle WA and then sailed to Sydney where we went to the East Hills Migrant Camp. My mum, now deceased, joined the Good Neighbor Council and met many migrant ships in Port Adelaide for many years after we settled in the Gepps Cross migrant hostel. She said she wanted to make the arrival in Australia for migrants as stress less as possible. Dad became a warrant officer in the 7th Scottish at Klemzig Barracks SA before he passed away. This summary was placed on the “Asturias” website by Steve Gregory.